After the ninth round, there are still groups where the top places are far from clear and in those groups it seems that the contest for the title is going to be very tough. The only player still to lead with perfet score ise Efroimski of Israel in Under 12 Girls. 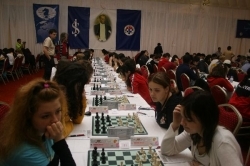 Left: Cansu Söylemez and Emel Kaya, two Turkish players before the game Right: Among the strongest players of the Under 18 Girls, there are WIM Katerina Nemcova and WIM Betül Cemre Y?ld?z. In Under 18 Girls' group, WIM Nemcova won against WFM Steil-Antoni and Czech WIM has 8 points leading the event. WFM Gunina wona crucial game against WIM Betül Cemre Y?ld?z and she has to win against Nemcova if she is to surpass Nemcova in the fight for the gold medal. 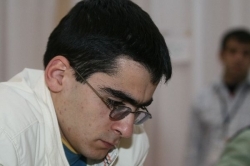 WIM Y?ld?z, WFM Steil-Antoni and WIM Mary Ann Gomes he drew against WIM Umudova have 6.5 points and still have chances to fight for anything in the event. 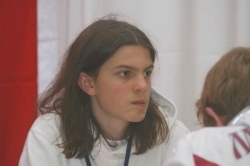 In Under 18 group, GM Popov drew against IM Edouard and still leading the group with 7.5 points but he is not that comfortable since IM Edouard of France and IM Grigoryan also have 7 points. Not only them bt also, Mexican star IM Leon Hoyos and FM Nakhapetiane also have 7 points. The two other GMs of the whole event apart from Popov, i.e. Howell and Rakhmanov have 6.5 points and within the shooting range for the top three spots. 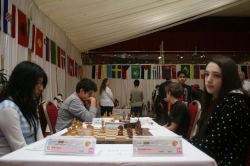 On the first two boards of the Under 16, first of whom drew with FM Chrila(2423) , IM Salgado Lopez(2460) and on the second board FM Recuero Guerra (2407) drew with Georgian FM Bregadze(2388). On the background, the runaway is none other than the renowned chess journalist reporting their results, none other than chess columnist and reporter of El Pais, Leonxto Garcia. The picture on the right reflects a player from under 18 group. 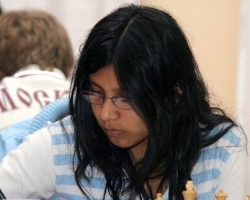 In Under 16 group, FM Chrila drew with IM Salgado Lopez and leading with 7.5 points. FM Recuero Guerra and FM Bregadze are sharing the second place with 7 points. The other players who also have 7 points are IM Kharchenko of Russia, FM Pereria of Portugal. 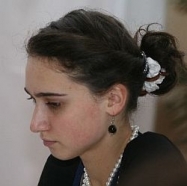 Kübra Öztürk in Under 16 has 6.5 points at the end of round 9 while Georgian Keti Tsatlashvili is sharing the lead in the same group with 7.5 points. 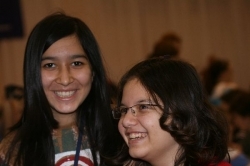 In Under 16 Girls group, WFM Girya and Tsatsalashvili drew their games and have 7.5 points. WFM Nakhbayev of Kazakhstan won against Iordanidou of Greece and joined them in the shared leading position before the penultimate round. 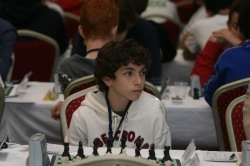 Ivanenko has 7 points while WFM Kübra Öztürk, winner of the two consecutive European titles in the same age group and the local hero of the host country. ...Mustafa Y?lmaz, highest scoring Turkish player in Under 16 group. In Under 14 group, FM Nidit lost against Wang and the latter is leading with 7.5 points together with the Swedish youngster Grandelius. IM Sjurigov is also within the shooting range with 7 points after winning against FM Robson. 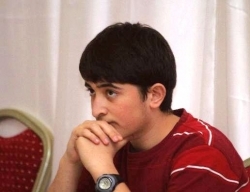 FM Ter-Sahakyan won against Popilski and among the players who have collected 7 points until round 9. Kanarek from Poland also has 7 points out of 9. 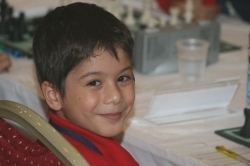 Ivan Bukavshin from Russia is the new leader of the Under 12 after winning against FM Bajarani. 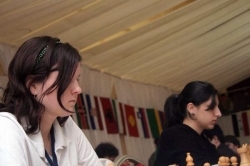 FM Nyzhnyk won against Han of China while Naroditsky won against Iranian player Idani to collect 7.5 points. The last player who has 7.5 points out of 9 is FM Gene Nakauchi from Australia. Girls Under 12 is still led by Efroimski of Israel with a perfect score, Eid from France. The second place is also comfortably occupied by Guo from China after she won against Kumari from India. FM Nyzhnyk will look for compensation of his loss against FM Bajarani against Bukavshin. 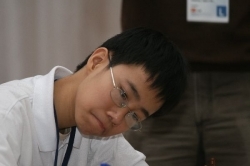 In Under 10 Wang won against Cheng and leads with 8.5 points. Lamard won against Duda and has 7.5 points as Antipov did against FM Alekseenko. The players having 7 points, CM Oparin, Prince and Luo are still fighting for medal in their own group. In women's section, Chiang is leading with 7.5 points joined by Pastuszko. Styazhkina is the other player to have 7.5 points followed by Fedyuk and Guo and Paramzina who drew with Chiang on the first board yesterday. 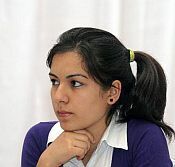 Perulu ,FM Deysi Core who faced the sole leader of Under 14 Girls, Georgian WFM Paikidze and managed to draw her game. In Under 8 Girls' group, Furtado and Mammadzade are leading with 7.5 points after winning against Nguyen, the former leader of the group and Zhou respectively. Abdulmalik of Kazakhstan also has good chances for a medal since she has 6.5 points. In Under 8 Group, Savenkov, leads with 8.5 points after she won against Qasimov who fell back to third place since Sinyanskiy won against Ayvazyan. The group is dominted by the talented Russian kids. 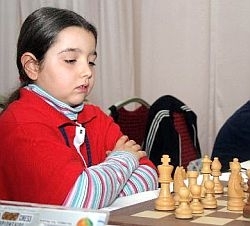 Buse Vatansever, a successful Turkish player in Under 8 Girls.